At Parapet, we believe in celebrating our own and this edition of the Cleaners’ Digest is no different. 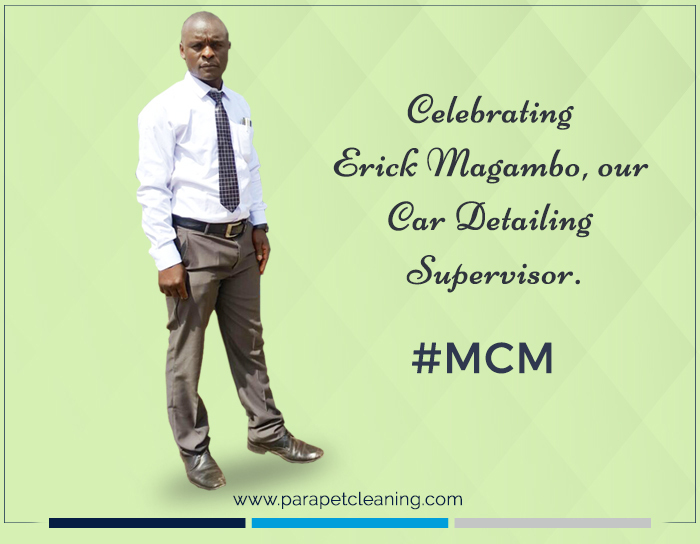 Erick Magambo is the Head of the car detail cleaning team at Parapet and when he is not at work, he loves a game of football or to watch soccer matches with his friends. We wanted to know more about him; what makes him tick. has memories about her from when he was quite young. He can actually remember the games they played together after school! Cleaners Digest: Magambo, not a common name, are you named after anyone? CD: When was the last time you cried? Erick: Men technically do not cry but in 2014, you guy! I had just been promoted from steward to head the Car Detailing team with my predecessor having left abruptly so it was baptism by fire! Not to mention the first car I supervised was a brand-new Range Rover… my fren! I didn’t even eat that day! Let’s just say I cried for nothing, it ended pretty well and has been a great journey ever since – 4 years later. CD: Do you have kids? CD: So does that mean jiko iko? Ama bado ni singles corner? Erick: Ahhh… she’s very much there, I’m off the shelves banaa (sorry ladies), her name is Dorothy Keya – soon to be Mrs. Dorothy Magambo. The most beautiful thing I ever laid my eyes on… smart, sharp, God Fearing, hardworking – what more can The Head of Detailing ask for omera? CD: What’s the first thing you notice about people? Erick: Their dressing. I take time to look good and I appreciate it when people look like they took some time to look good. CD: Do you have any special talents? Erick: Yes. I am very good at playing football – to be specific, No. 9 – the guy that scores – Future Sanchez my guy! As you can tell Arsenal is where it stops for me… I don’t care what you say, you cut my veins, utaona tu ARSENALI! CD: Where were you born? Erick: Kapsabet, Nandi… Pointy manenos… Kalenjin and Luhya – doesn’t get any better! CD: Do you have any siblings? CD: What did you want to be when you grew up? Erick: Procurement officer – I worked in Dadaab in procurement 2 years ago and I found it very fulfilling! CD: What was your favorite/worst subject in High School? CD: How do you relax after a hard day at work? Erick: As I answer this, I must mention that this does not in any way take any of my manly points away but an episode of Simply Maria does it for me. CD: What makes you very angry? Erick: When I have to repeat instructions over and over again…Oh my! I’m working on my patience though, day by day. CD: If you had all the money in the world, where would you go? CD: Favorite memory from childhood? CD: What motivates you to work hard? Erick: Seeing my team working together and learning every day gives me the motivation to push them even further in their careers, I was once a steward, just like them, and look at me now and yet; this very element pushes me to do even better. CD: What’s the one thing people don’t know about you? CD: Lastly, Erick, who in our society do you look up to as your role model? Erick: This will sound cliché, but my boss, the Group CEO of my organization, Mr. Alex Nyaga – I find him to be an incredibly hands-on leader, inspires greatness in all of us and a thought leader on many issues. I could go on, but I am sure a lot of people echo my sentiments. Something else, Erick loves a good conversation. If there’s a coke and football to push it along, when Arsenal is playing, it’s even better. Now we know a bit more about the guy who is in charge of bringing back curb appeal in our customers’ cars. Stay with us for more stories from the people of Parapet! Parapet’s 7 minute Upholstery Cleaning Hack! 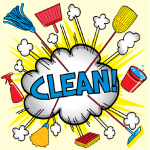 Parapet’s Secret House Cleaning Hacks! Who NEEDS professional cleaning services anyway? wish to appear here one day. you never know Chrispinous… send us your story on marketing@parapetcleaning.com we will make you SHIIIINE! Eric’s interview is well done and he comes across as a really great down-to-earth fellow. 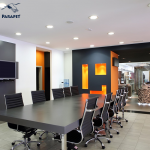 He has a sense if humour that flows through his words….thank you Parapet for celebrating your team! thank you for your kind comments Cathy, we appreciate it. Our team is at the center of everything we do so it goes without saying, they are our stars! Copyright © 2017 Parapet Cleaning Services. All rights reserved.